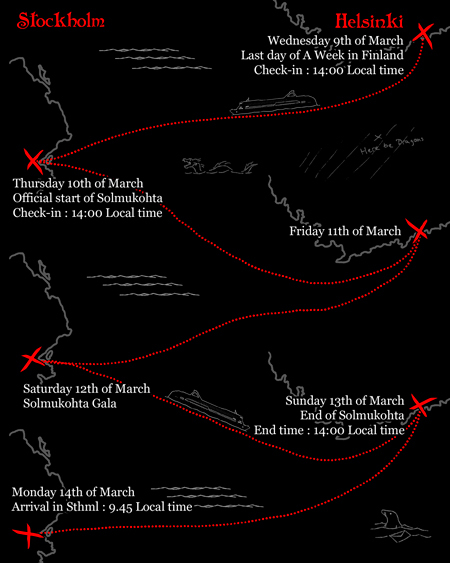 The Solmukohta check in on Wednesday in Helsinki: 14.00 local time. The Solmukohta check in on Thursday in Stockholm: 14.00 local time. The ship will not wait, if you are late. The ship or the check in crew will not wait, if you are late. Solmukohta program will be updated later to the website. in Conference area, Cafe Orient, Bistro Maxime, Atlantis Palace, Casino bar, Promenade bar, Old Port Pub, and Commodore Lounge. Satellite connection during voyage is occasionally slow. On the ship you can pay with euros (EUR), Swedish kroner (SEK), with most credit cards. There is an ATM onboard.